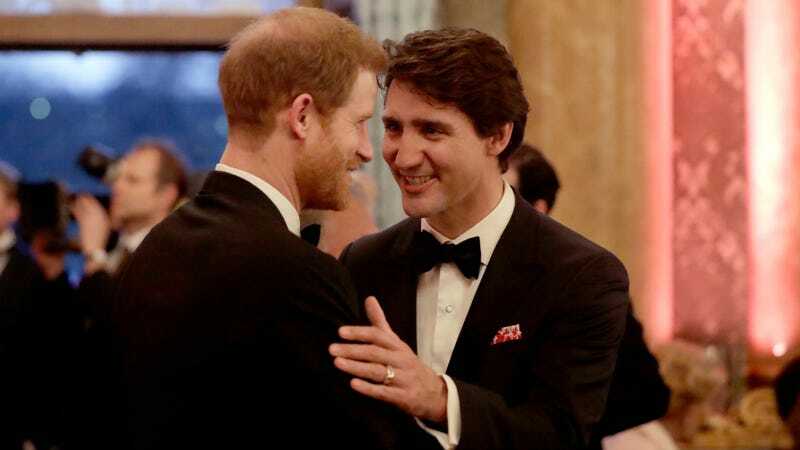 I cannot stop looking at this picture of Prince Harry and Justin Trudeau. Are they swapping Toronto dinner recs? Is does Prince Harry belong to Canada now, even though he is marrying an American? Could they be talking about how desperately they miss Barack? However, because I now think exclusively in terms of romance novel plots, I look at these photos and ask myself: Where’s the book about a royal and the prime minster of another, closely allied country? If you’re a world leader or a royal, where else do you even meet people besides receptions like this? Free sequel idea for anybody who’s already writing a novel inspired by Harry and Meghan! Give Harry a younger sibling, and turn Trudeau into the single mutual friend who introduced the couple from book one. They hook up at the wedding, then have to see each other at a bunch of meetings. Third book maybe you work a pseudo Macron in there? Just spitballing. Anyway, send me a copy when you’re done.